StagePool is Northern Europe’s largest audition and casting portal for professional, amateur, and child performers and backstage workers. The online entertainment recruitment service allows performers to apply for thousands of jobs across Europe, as well as offering free job advertising for producers. StagePool helps thousands of members find more than 80,000 jobs a year, and more than 10,000 employers to find actors, artists, extras and crew for their productions. Creating a consistent brand image is important for many companies. Email signatures are often a forgotten tool for promoting an organization’s brand, with many companies leaving employees to manage their own. 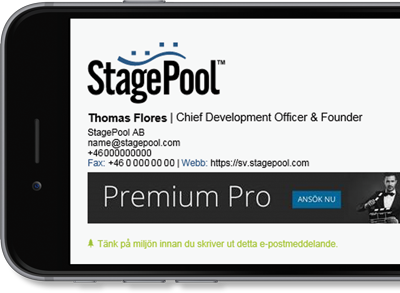 This was the case for Thomas Flores, Chief Development Officer & Founder of StagePool. “StagePool felt the need to control the content of our employees’ signatures, as they were pretty much living their own life, and the content was hardly updated,” said Mr Flores. Having recently migrated to Office 365, Mr Flores began to look for an email signature solution.